Upon arrival in Haridwar meeting and assistance drive for Barkot, located on the foot of Yamunotri. Drive via Mussoorie and visit Kempt Falls on the way (If time permits). On arrival at Barkot, check-in to your hotel/camp. Rest of the day is free to relax and store your energy for the Pahad (hill) Yatra of Yamunotri the next day. Dinner and Overnight stay at Barkot. Barkot is a town and a nagar palika in Uttarkashi District in the state of Uttarakhand, India. It is located on the banks of the Yamuna river. 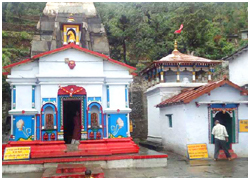 Barkot is located 48 km from Yamunotri. NH-123 and NH-94 are major highways connecting in Barkot. Note - During day 2 in Rishikesh / Haridwar it will take 3 to 4 hrs to get hill permit / certificate and Clarence of transport for Chardham Yatra. After breakfast, depart for Hanumanchatti (40 Km), Janki Chatti (8 km). 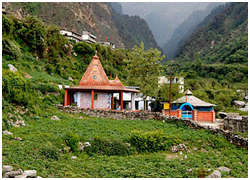 Here you will begin the First Pahad Yatra of Yamunotri (5 Km trek). You can hire a Doli or a horse, for your trek (Cost Not Included). The trek passes through lush green valley, a profusion of conifers, rhododendrons, cacti and several species of Himalayan shrubs. Yamunotri (altitude 3,291 m), the western most shrine of the Char Dhams, is dominated by Banderpunch (6,361 m). 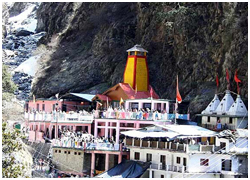 Yamunotri is the source of the river Yamuna, the twin sister of Varna, the Lord of Death. Yamuna is also the daughter of Surya the Sun. The actual source of the river originates from Champasar Glacier 1 km a head of the shrine, at an altitude of 4,321 mts. On arrival by afternoon in Yamunotri take holy dip in Yamuna River and perform Pooja, and take the same route back to Barkot, check in at Hotel / Camp. Dinner and Overnight stay at hotel in Barkot. Yamunotri Temple is situated in the western region of Garhwal Himalayas at an altitude of 3,291 metres in Uttarkashi district, Uttarakhand. The temple is dedicated to Goddess Yamuna and has a black marble idol of the goddess. After breakfast drive 165 kms to Reach Harshil, & evening free for Relax. Dinner & overnight stay at Harshil. Harsil is an unspoiled and hidden jewel of Uttrakhand state offering ample scope for people seeking peace and serenity in the lap of Himalayas. It is situated on the bank of Bhagirathi River (Ganga River) at an elevation of 2620 mts above sea level enthusiasts and nature lovers. Dense deodar forest, gushing water of Bhagirathi, chirping of birds, salubrious environment and serene environs are the highlights of this little secluded destination. Situated on the banks of River Bhagirathi is Uttarkashi, an important pilgrim centre which is often equated with Kashi (Varanasi). It is situated at an elevation of 1150 meters. During Megh Mela, people visit Uttarkashi to take a holy dip in Bhagirathi along with their village deity. 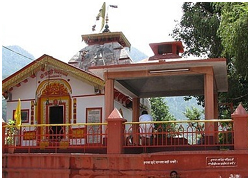 Dedicated to Lord Shiva, Kashi Vishwanath Temple is an ancient and the most famous temple in Uttarkashi. It is said to have initially been built by Sage Parshuram and which was later renovated by Maharani Khaneti, wife of Sudarshan Shah in 1857. The Shivling is 60 cms in height and 90 cms in circumference. This is the most important shrine of Uttarkashi and should not be missed if you are traveling to this part of the country. After early morning breakfast check out from the hotel and drive for Guptkashi/Rampur/Sitapur. On arrival check in at hotel. Rest of the day free to explore the Guptkashi town. Dinner and Overnight stay in Guptkashi/Rampur/Sitapur hotel/Camps. Guptakashi, Gupta Kashi or Guptkashi is a fairly large town located at an elevation of 1,319 metres (4,327 ft) in the Kedarkhanda ('khanda' means "sector"), in Garhwal Himalayas of Rudraparyag district in Uttrakhand, India. It is known for its ancient Vishwanath Temple dedicated to the god Shiva, which is similar to the one in Varanasi (Kashi). The other wellknown temple here is dedicated to Ardhanareshvara, a half man half woman form of Shiva and Parvati. 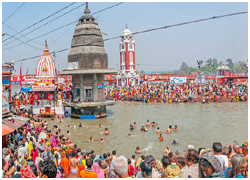 The name Guptakashi has legendary significance linked to the Pandavas, the heroes of the Hindu epic Mahabharata .Its religious importance is considered next to that of Varanasi, believed to be the most pious of all Hindu pilgrimage places. 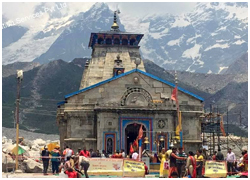 Kedarnath Mandir is a Hindu temple dedicated to Lord Shiva. It is on the Garhwal Himalayan range near the Mandakini river in Kedarnath, Uttarakhand in India. Early morning you get up before dawn and after taking bath you are at the temple by 4:45 am for the 'Abhishek' to Kedarnath Shiva. Everyone can go inside Garbha Griha and touch the idol. You can also prostrate with your head touching the deity etc. After darshan and puja you come out of the temple and return to the Camps / Lodges. Later you'll start the return trek of 20 km from Kedarnath to Sonprayag. The vehicles wait for you in Sonprayag Car Parking and you'll drive to your hotel (Sitapur)/Guptkashi. Dinner and Overnight at Rampur /Sitapur/Guptkashi. This morning, you check out of the hotel and drive to Badrinath via Joshimath. After driving through some wonderful Ghat road you arrive at Badrinath. On arrival check into the hotel. After some rest and refreshments you are all set to go to Badrinath Temple for darshan in the evening. But first you have to go to Tapt Kund (Hot Spring), take bath and then go to the temple. 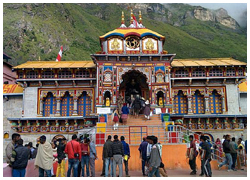 Dedicated to Lord Vishnu, the temple of Shri Badrinath Ji is 15 meters in height, built in the form of a cone with a small cupola of a gilt bull and spire. Later back to hotel. Dinner and Overnight stay at hotel. Badrinath or Badrinarayan Temple is a Hindu temple dedicated to Vishnu which is situated in the town of Badrinath in Uttarakhand, India. The temple and town form one of the four Char Dham and Chota Char Dham pilgrimage sites. This morning, go for Badrinath darshan. After darshan return back to hotel, breakfast at hotel and proceed for Badrinath local sightseeing visit Mana Village, Vyas Gufa, Ganesh Gufa, and Mata Murti temple. Afternoon driver back to Srinagar via Karanprayag & Rudraprayag. Rudraprayag is a small pilgrim town on the holy confluence of river Alaknanda and Mandakini. On arrival check in at hotel. Dinner and Overnight stay at hotel. Mana Village: Mana is a village in the district of Chamoli in the Indian state of Uttarakhand, located at an altitude of 3,200 meters. Mana is the last Indian village situated at Indo-China Border. Vyas Gufa: At a distance of 5.5 Km from Badrinath Bus Stand, Vyas Gufa is an ancient cave located on the banks of Saraswati River at Man Village in the Chamoli District of Uttarakhand. Vyas Gufa is believed to be the place where sage Vyas composed the Mahabharata epic with the help of Lord Ganesha.A distinct feature of the temple is the roof which resembles the pages from the collection of his holy scripts. Morning breakfast at hotel, and you are on your last lap of this Chardham Yatra journey. Drive back to Haridwar. On reaching Haridwar transfer to Railway Station / Bus Stand / Dehradun Airport. All Transport & Hotels Related Taxes. Rates are not valid for Festive peak season. Rates are subject to change if there is any Fair & Festival, Major conference, events in travel destination. Early check in / late checks out is subject to availability of rooms. In Chardham sector maximum hotels are preferring 12:00 Noon Check in & Check out timing. Vehicle confirmed will be as per Itinerary and not at disposal. AC will work only in the plains and will be switched off during hill drives. Specially for the Chardham sector Ac can work only in Haridwar & Dehradun's plain / surface area. It is highly depending on the package you have opted. Any sightseeing missed due to natural calamities / weather conditions / for any unforeseen reasons is non-refundable or non-adjustable. ITINERARY MAY CHANGE AT ANY TIME - We reserve the right to alter, amend, change or modify the tour package and itineraries before or during the tour. We will make reasonable efforts to notify you promptly of such changes / events sufficiently in advance during booking or prior to departure of the tour.